Cannot be Special Summoned. Requires 3 Tributes from either side of the field to Normal Summon to that side of the field (cannot be Normal Set), then shift control to this card’s owner during the End Phase of the next turn. Cannot attack. Your opponent cannot target this card for attacks or by card effects. You can Tribute this card; Special Summon 1 “The Winged Dragon of Ra” from your hand or Deck, ignoring its Summoning conditions, and if you do, its ATK/DEF become 4000. The Winged Dragon of Ra – Sphere Mode has been a useful Side Deck and sometimes a Main Deck card for some time. By far the easiest of the Winged Dragon of Ra monsters to Special Summon, you wipe three monsters off your opponents field for a monster they can’t attack with or target with effects. It is all-but useless to them. Their is a chance that they could use Sphere Mode to Link Summon or Tribute Summon, but even if they do, you have already gone +2 off the tribute. It may take up your Normal Summon for the turn, but that is a small price to clear out your opponents field with a monster they can’t use. You get your card back in the End Phase of the next turn, when you can do whatever you want with it. If you run The Winged Dragon of Ra, you’ll get a free Ra with 4000 ATK/DEF. This is a great card to take care of boss monsters your opponent has on the field, constricting your playability. While tributing Pendulum Monsters your opponent has may not get rid of them for good, it does take away options they have, and if you destroy their scales, can halt their progress. This card is perfect against aggressive decks that push with more than three monsters each turn or handling powerful Link Monsters like Firewall Dragon, Borreload Dragon, and the upcoming Skulldeat. 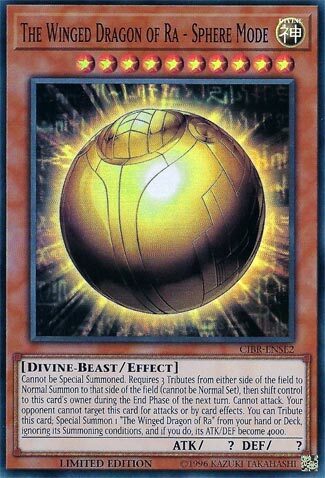 If Sphere Mode wasn’t able to be used for a Link Summon or a Tribute Summon, it would be a spectacular card. Advanced-3.5/5- Solid Side Deck card. I like it. I like it because it’s a Normal Summon. The Winged Dragon of Ra – Sphere Mode is a Level 10 Divine Divine-Beast-type monster with ? Atk and ? Def. It cannot be Special Summoned, and it requires 3 Tributes to Normal Summon. The best part is that it can be Normal Summoned to either side of the field depending on who has all 3 monsters to tribute. This is better than a Kaiju for defense since it gets rid of more monsters and doesn’t do anything useful. It can’t really attack with ? Atk. It cannot be Normal Set to either side. It can’t be targeted with effects or by attacks by the opponent. It can however, be tributed or used for Extra Deck Summons. Then it returns to the owner during the End Phase of the next turn. Kaijus don’t do that. If you happen to run Ra, you can tribute Sphere Mode to Special Summon Ra while ignoring the summoning conditions. This Ra would have 4000 Atk and 4000 Def. The major flaw is that it takes your Normal Summon, but that’s balance. It’s a good side deck card even without Ra. It’s necessary if you run Ra. The most noteworthy promo for this Special Edition is up for review today, and it is basically a bigger Kaiju, The Winged Dragon of Ra – Sphere Mode. Sphere Mode is like the original Ra, where he cannot be Special Summoned, though Immortal Phoenix can ignore this clause, but I doubt many play Immortal Phoenix. It requires 3 tributes on either players field to summon it to their field, it cannot be set. This is a great way to clear out your opponent’s board of strong monsters, and all they get is a 0/0 Sphere. Also it will return to the owner’s board during the next End Phase after he was summoned, so you will end up with this card. This card cannot attack and cannot be targeted for attacks or effects. Raigeki can get rid of this, though, kinda not like a God now is it? Finally, you can tribute this card to summon The Winged Dragon of Ra from your hand or deck ignoring the summoning conditions (in this case of Ra being unable to be Special Summoned) and Ra will have 4000 ATK and DEF. If you play Sphere Mode, playing Ra does sound more promising since it will be very strong and it can do some board clearing at the cost of 1000 per card. Also Ra isn’t like the other Gods and he won’t go to the GY the turn he is Special Summoned, because he has that cannot be Special Summoned clause that Sphere Mode ignores. This card is a great way to out a powerful board, a good side deck option, and can get you somewhat of a powerhouse with a 4000 ATK and DEF Ra. Since Kaiju monsters have existed for some time, little more needs to be said for The Winged Dragon of Ra – Sphere Mode. It’s an extreme card that is so alluring in such a game state. And perhaps you can just tell that soon this will be a necessary evil, a monster to turn back the figurative, or perhaps literal tide. It currently exists in limbo, as we are not quite to the pinnacle of game speed to where you should expect your opponent to have three monsters on the field every time you start your own turn, but we’re getting there. In the meantime, link monsters have been introduced, and that actually gives the opponent options after the deed’s been done, which was never there before. So a guaranteed -3 to the opponent becomes a -2… but that’s still a -2, and an uncounterable -2 at that. What else should be said? Unless Ra actually gets unifying support to make its own deck, Sphere Mode will always be that option for truly dealing with extreme monster rush threats and nothing more, but it’s heavy-handed and inconsistent, and loses to Kaiju in the end. But it also does something Kaiju can’t. It will remain in the player’s back-of-the-mind thinking for some time as long as that is the case.